Lou Marcelou is a beautiful village house in St Croix du Verdon, a typical Provencal hilltop village in a stunning location overlooking Lac St Croix in the Parc National Du Verdon. The house dates back to pre-Napoleonic times and is full of character and charm with exposed stone walls and original wooden beams. The Lac is a deep turquoise colour and is a similar temperature to the Mediterranean. It has beaches all around for swimming and water sports. 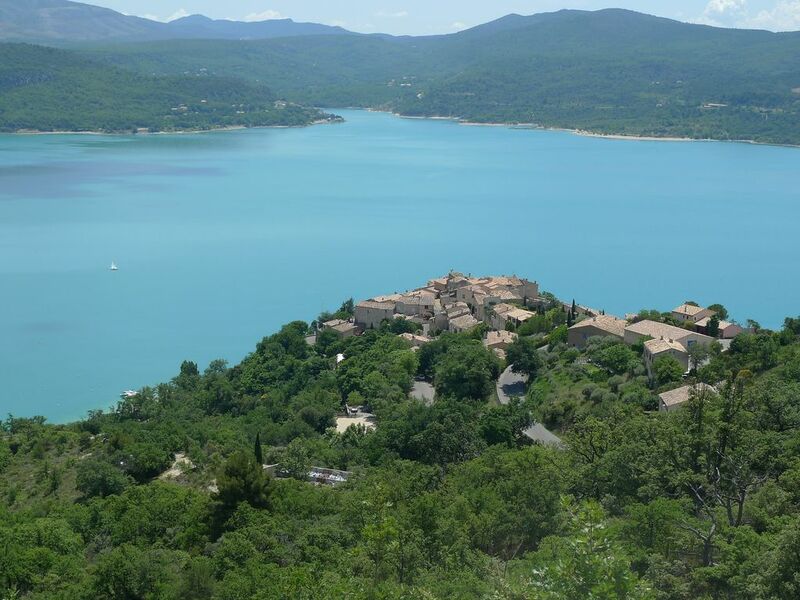 With breathtaking views of the lake and the foothills of the Alps, Lou Marcelou offers a superb location in this beautiful region of France and can be reached in under 2 hours from the airports of Marseilles and Nice to the south. Christine and I have been letting holiday cottages for over 10 years. We are lucky enough to have acquired properties in beautiful places where we like to stay. We stay in them frequently ourselves and so like to keep them to the highest standards. Please come and visit one of our cottages in England in the Peak District and Dartmouth in Devon or in Provence in the south of France. We also have a beautiful B&B on the Chatsworth Estate in Derbyshire. Beautiful modern shower room on the Mezzanine with washbasin and WC. Additional WC on the ground floor. The downstairs is an open plan living area with separate dining and seating areas with a comfortable settee and antique furniture. There is a stunning view of the lake and distant hills and the double height ceiling provides a wonderful sense of space. New kitchen with electric 4 ring hob and oven. Fridge with icebox. Granite worktops. Well equiped to cater for 4 and plenty of storage. Notes on accommodation: The property is let on a Sat-Sat basis. Outside: There is a balcony which provides a very pleasant outdoor seating area. The village square and other outside seating are only a few meters away. The lakeshore where there are numerous beaches is only 5 min walk. Utility Room: Iron, drying rack. Washing Machine Cleaning / Towels / Linen / Maid service: The prices quoted are for the property only. It must be left clean and tidy. If you do not wish to clean the house on departure this can be arranged at a cost of €40. Towels and bedding are available for an additional charge of €25 for 2people €30 for 2+. There is also WIFI internet access. Lou Marcelou is situated on the shores of Lac St Croix a magnificent turquoise lake fed from the water of the Gorges du Verdon. the Lac is around 14km long and is a similar temperature to the Mediteranean which makes it ideal for swimming and water sports. There are numerous beaches around the shores all within a few minutes of the house. There is a sailing club just below the village and also a jetty where canoes, kayaks and pedalos can be hired. Nearest Airports are Marseilles, Nice and Avignon - all around 1 1/2hrs. Car is essential. Gorges du Verdon - 10km. Riez (local market town) - 8km. Manosque - 30km. Ste Croix du Verdon is a beautiful Provensal village perched on a hillside overlooking the lake. The village shop (100m away) has a good range of produce including locally produced wines. Bread is baked twice a day. In the village there is one hotel offering a tourist menu and a further 2 restaurants. There are also a number of tourist shops selling good quality produce. Everything is within a few minutes walk from the apartment. Booking Notes: 30% deposit with booking. Balance together with €100 security deposit 4 weeks prior to holiday. Changeover Day: Saturday changeover - Arrivals from 15h00, departures 10h00. Notes on prices: Please contact owner.